We are looking for someone amazing to join our team. Our purpose, as the Talent Solutions team, is to help individuals to use and develop their strengths as well as support organisations to transform their culture and people. We need someone who thinks a bit differently, is strong in creativity and in storytelling to help us bring this content to life. 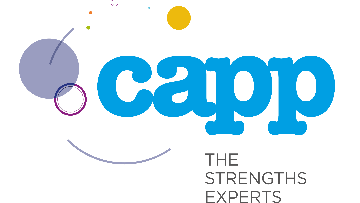 Capp is an online assessment, development and talent technology business. Our clients include large pharmaceutical, technology, financial, professional services and retail organisations. We are the UK’s leading provider of strengths-based products and solutions and our results are industry recognised. We are a global provider of end-to-end recruitment and talent development solutions, covering activities such as upfront success analysis and development discovery, leadership development design and delivery and the provision of talent assessment products. We are a scale-up business of 100+ people with strong plans for international expansion, building on a twelve-year history of 30%+ year-on-year growth. The Talent Solutions team are responsible for leading the design, delivery and evaluation of our talent development programmes and products. We are seeking to appoint a Creative Development Consultant as a result of our continued expansion. The focus of this role will be to lead on the design of our learning content across a variety of mediums. These can be face to face sessions, virtual classrooms, virtual reality experiences or online products. There will also be a need for client and internal stakeholder management, project planning and inputting into the Talent team strategy. We are looking for a self-directed individual who is powered by curiosity. They should have a passion for technology and a desire to explore it’s impact on behaviour, plus a history of creative endeavours and out the box thinking. Their ability to tell a story and spin a narrative from any content should be second to none. We also believe some experience of psychology and, or, learning theory would support them in this role.